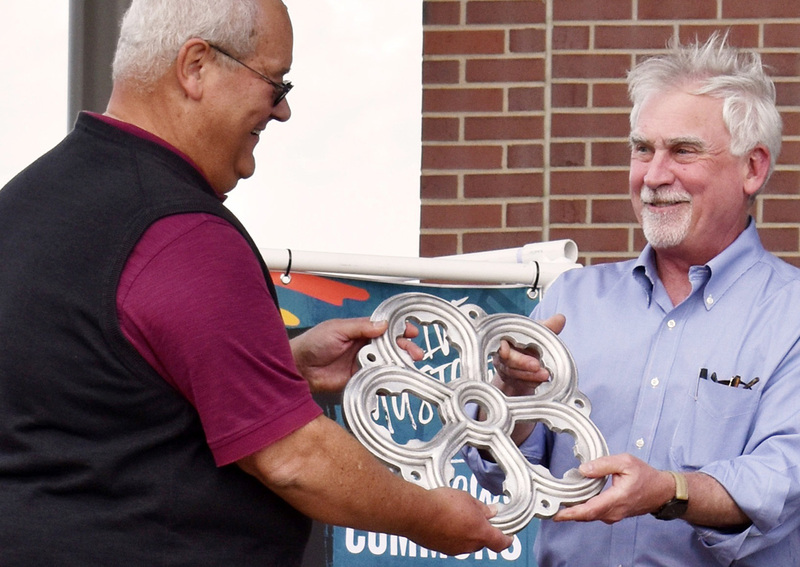 Clarksville Foundry recently partnered with award-winning sculptor Vaughn Randall to cast a public art piece to commemorate the grand opening of a new public space in downtown Clarksville. 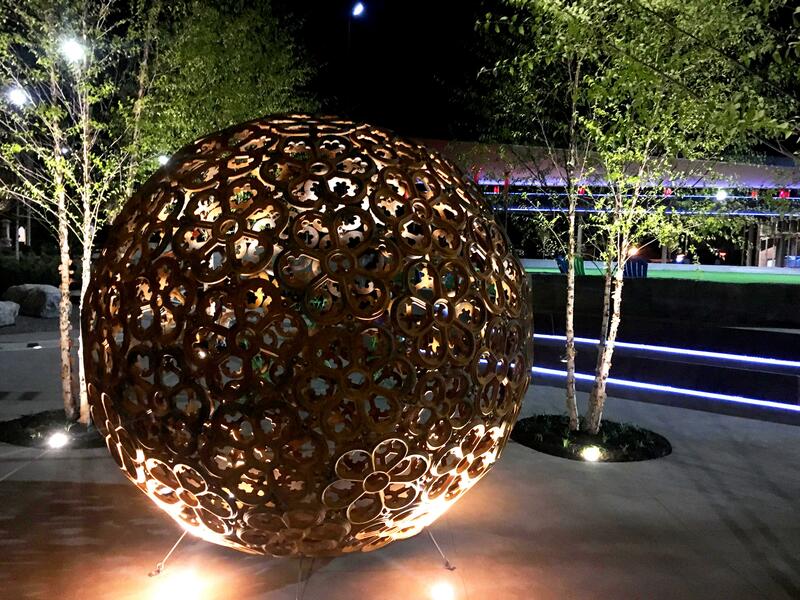 The sculpture is the first public art piece in the newly opened Downtown Commons. 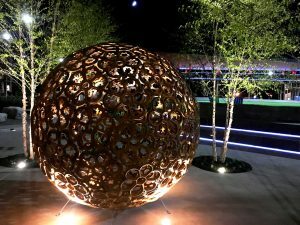 Each individual casting of the sphere mimics the design of the First Presbyterian Church’s rose windows, which overlook the park. Clarksville Foundry reproduced the church’s bell tower windows in 2015 after the original wooden casings were showing significant signs of wear and tear. “Window to the World” illuminated at Downtown Commons. 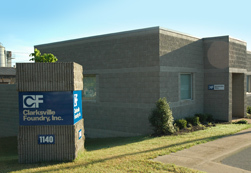 Clarksville Foundry completed the castings for this public art sculpture. 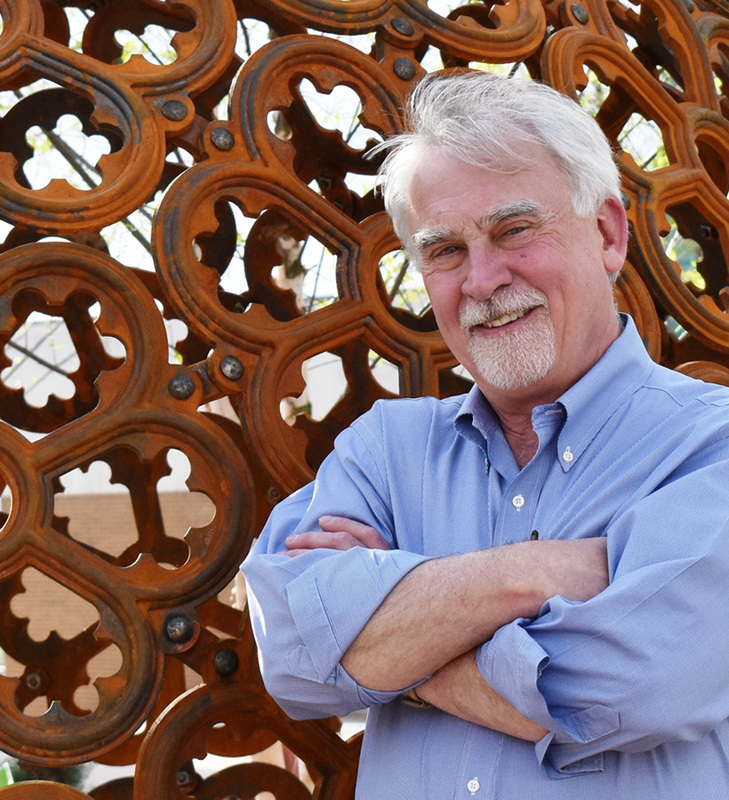 Several months ago, Clarksville Foundry President Charles Foust Jr. saw a sculpture by longtime friend and frequent collaborator Randall, an art professor at the State University of New York-Cortland. It sparked an idea to connect Downtown Commons to the historic architecture surrounding it. First, Randall created sketches and patterns for the piece. 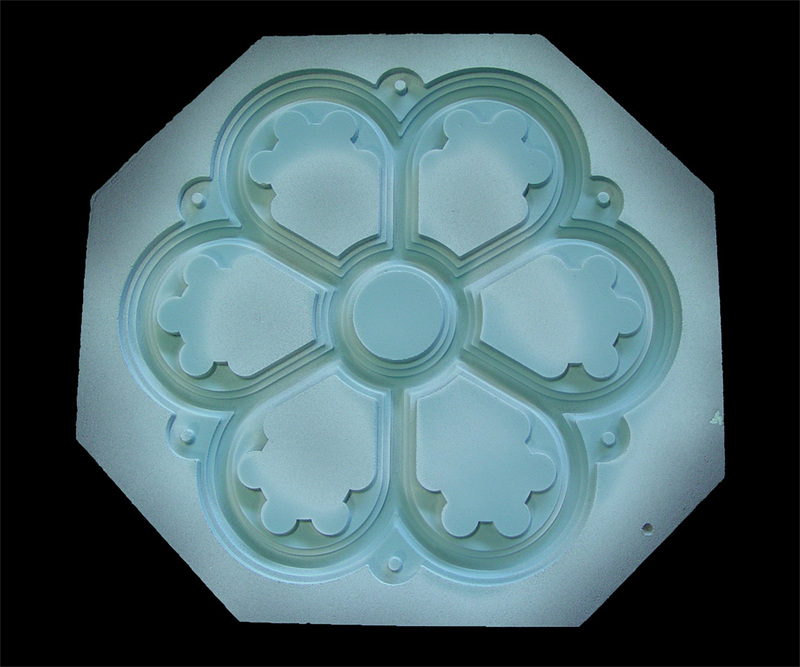 In turn, these patterns were then sent to Clarksville Foundry for casting. 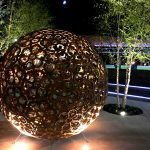 The resulting ductile iron sphere-shaped sculpture, with a diameter of 8 feet, features 92 individual castings. 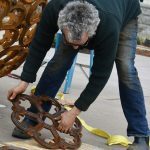 Randall came to Clarksville, along with studio assistant Erin Schiano, to assemble the finished castings into the rust-colored sculpture in the days prior to the unveiling, April 18. 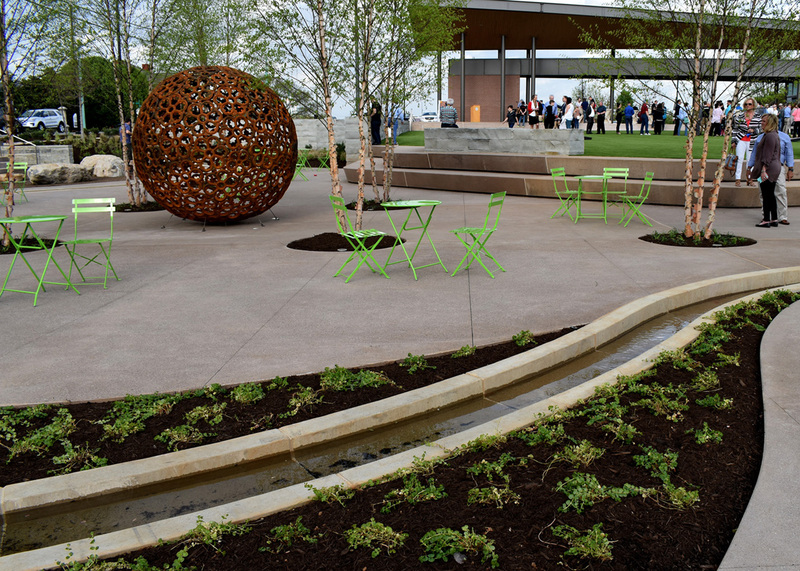 Downtown Commons serves as a public gathering space equipped for concerts, outdoor festivals and family activities. 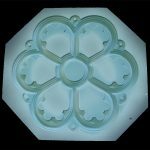 Randall pointed out the Romanesque style of the First Presbyterian Church circular windows and the many parts it takes to make a whole – a sentiment that has applications in both religion and community life. 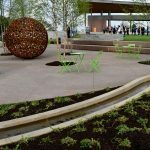 “This piece for me is more about the fact that this church appears to be the community center and impetus for this whole park,” Randall said. 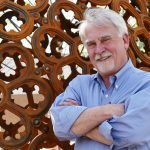 The Foundry worked with Vaughn Randall previously to produce “Rosette Bobbin” sculpture, an 8,000-pound ductile iron masterpiece. Reminiscent of a wagon wheel with elements of a church rose window, a replica sits on a 5,000-pound limestone base on Clarksville Foundry’s front lawn. The original sculpture, which featured 26 individual castings from Clarksville Foundry, was installed in August 2006 at the University of Alabama at Birmingham. 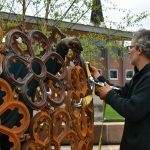 It took roughly two days for Randall and Schiano to assemble the Downtown Commons sculpture, using a system of straps, jacks and levers as the pair methodically bolted together the individual castings. 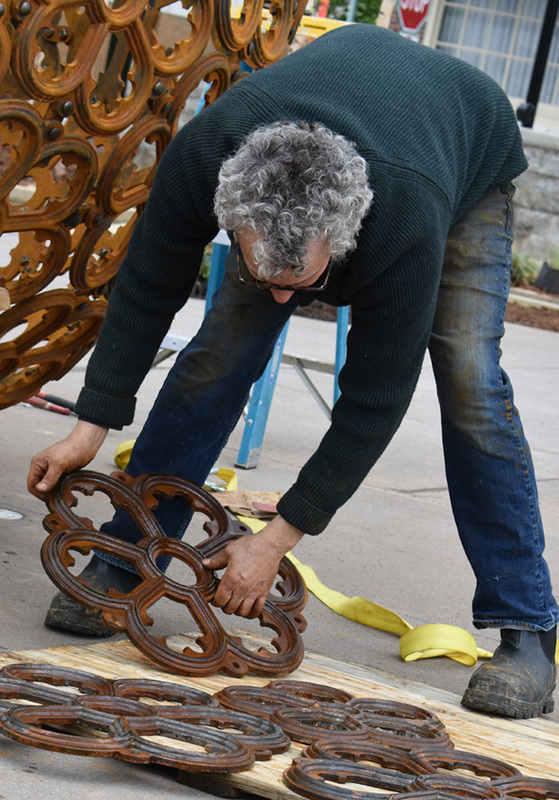 “What I like about art – sculpture especially – is that every time I build a piece, it’s an adventure to try to figure out how to put it together,” Randall said. 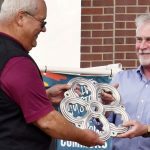 Two Rivers Company, a downtown revitalization organization, sponsored a sculpture naming contest. “Window to the World” was the name selected from a pool of more than 40 entries. 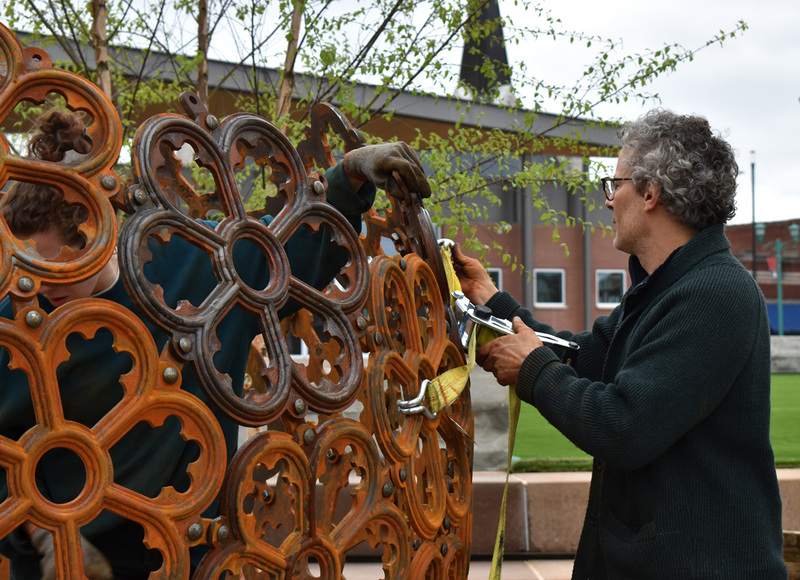 Submitted by former Presbyterian pastor Robert Lueck, he cited the sculpture’s connection to the house of worship’s windows and what it symbolizes for the community at large. “Window to the World” was commissioned for Downtown Commons by the Montgomery County Commission and the Public Art Committee.